Getting an Overseas Employment Certificate (OEC) or exit clearance can be a nightmare for many Overseas Filipino Workers (OFWs). OEC processing can take them an entire day lining up for hours and wasting precious time they could’ve spent with their families instead. It gets worse when OFWs come back home to spend Christmas holidays and attend school graduations. According to the Department of Labor and Employment, as many as 7,000 OFWs apply for an OEC per day during peak seasons. The result? Incredibly long lines at the Philippine Overseas Employment Administration (POEA) offices all over the country and thousands of frustrated OFWs. Are you a returning OFW? 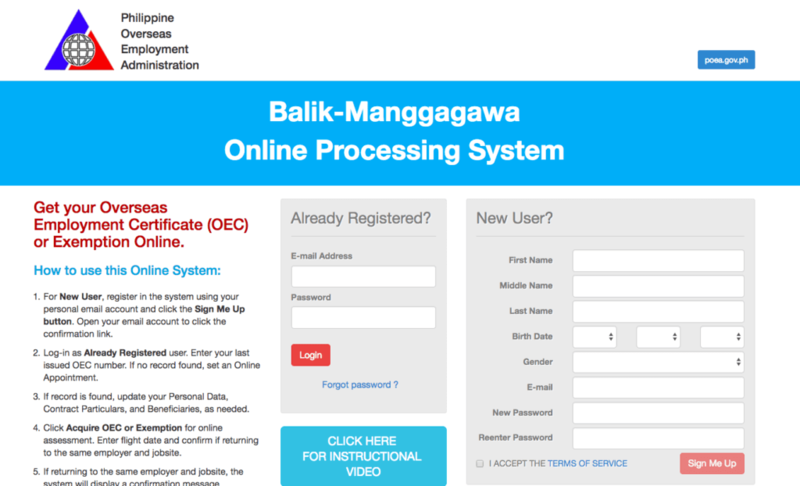 Save yourself from the stressful and tedious process of securing an OEC—use the Balik Manggagawa Online Processing System or BM Online. What is BM Online and Who Can Use It? The BM Online is an online facility at the POEA website that OFWs can use to get their OEC online anytime and anywhere in the comfort of their homes. 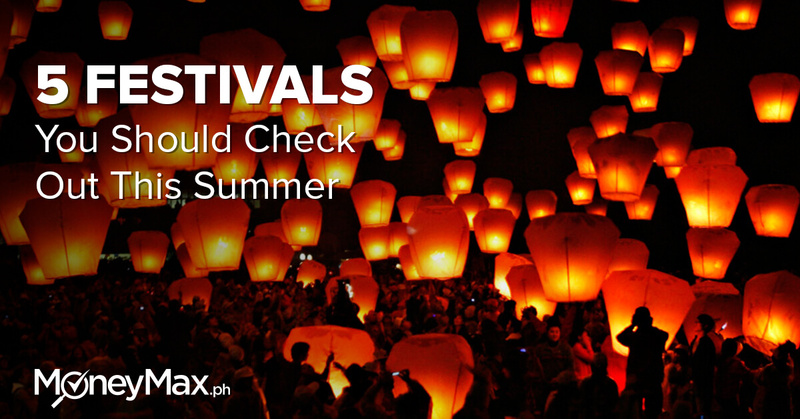 No need to visit the Philippine Overseas Labor Office in their country of employment or line up at a POEA office or OEC processing center during their vacation. 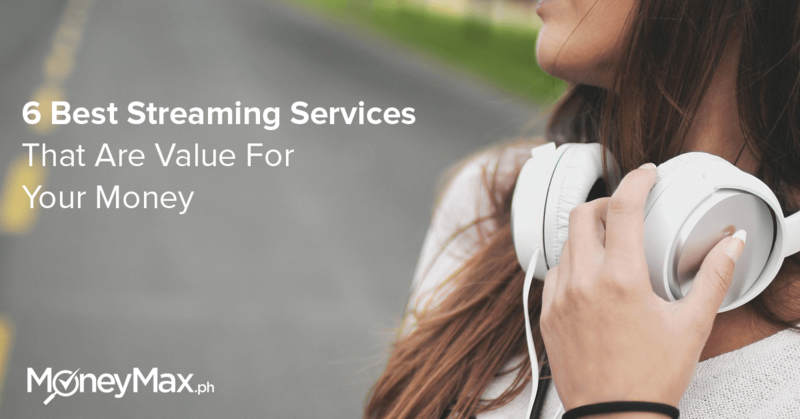 This online service is available to vacationing OFWs who are returning to the same employer and job site and have a record in the POEA database. Securing an OEC via BM Online costs PHP 119.50 (processing fee of PHP 100 plus e-payment service fee of PHP 19.50). OFWs who aren’t eligible for a straight OEC online application will be redirected to the facility’s Appointment Page to choose a schedule and venue for regular processing. 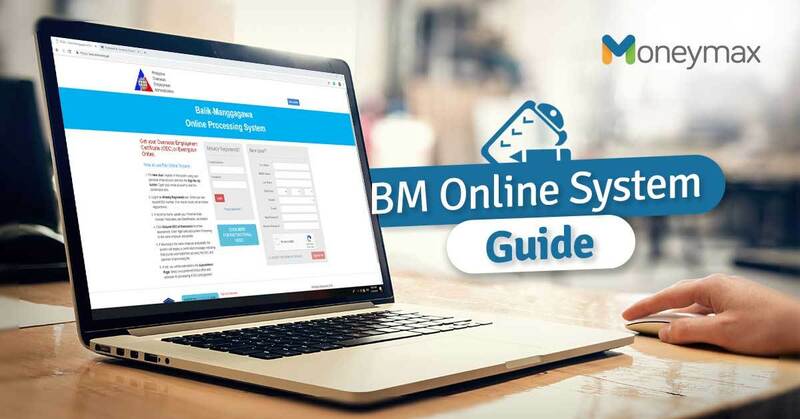 Why Register via BM Online? 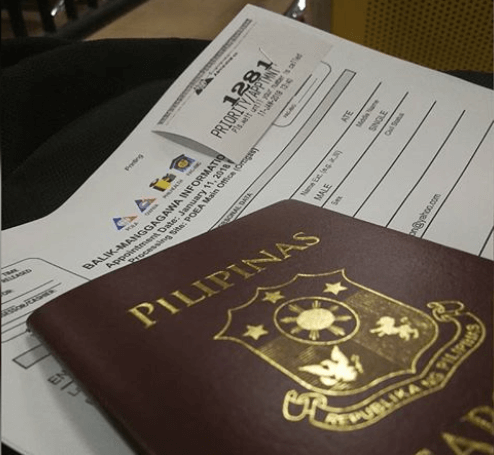 All OFWs—whether they’re exempted from getting an OEC or not—must register with the BM Online System each time they return to the Philippines for vacation. When you register, the system determines if you’re exempted from getting an OEC based on the POEA records and relays your data to the Bureau of Immigration. But what if you don’t register? During your pre-departure at the airport, the immigration officer will refer you to the Labor Assistance Counter (LAC) for encoding of your data and evaluation. This means you’ll have to wait until you’re cleared for departure (or worse, you’ll be asked to submit travel documents.) If it takes too long, you might miss your flight. Avoid the hassle—make sure to register before you return to your employer abroad. It takes just a few minutes to complete. Before you can start getting an OEC or exemption using the BM Online System, you’ll have to create an account first. Fill out the sign-up box at the right side of the page. Make sure to indicate an active email address. The Terms of Service page will pop up. Click Accept. The BM Online homepage will appear again. Click Sign Me Up. You’ll see a pop-up notification about the successful creation of your account. Click Okay. Check your email for a message from POEA with a confirmation link. Click on that link. You’ll see a pop-up notification about the successful activation of your account. Click Okay. Once you’ve activated your BM Online account, you can already access the system for straight online OEC processing, setting an appointment for regular processing, or getting an exemption. Log in to your account as an “Already Registered” user. Enter your email address and password. Click Login. If your record is found, you’ll see a confirmation pop-up. Confirm your employer and job site information by clicking Yes (If you’ll work for a new employer or job site, click No to set an appointment). Fill out the Personal Data, Contract Particulars, and Legal Beneficiaries forms. When you’re done, click Save Changes. If you’d like to make corrections, click Edit. Your My Profile page will appear. Click Change Photo > Upload Photo to upload a profile picture. Choose then click Upload. Click Next Step at the right side of the page. Enter your expected flight schedule. 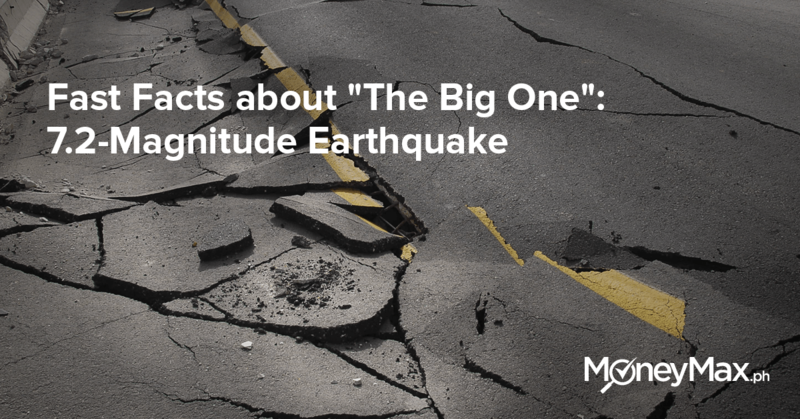 The date must be within the 60-day OEC validity period. Click Submit. A final confirmation pop-up will appear. Click Yes. You’ll see the Payment page with four payment options: Banks (over the counter), Banks (online), Mobile Payment, and Non-Banks (over the counter). Click on your preferred payment method. A payment confirmation pop-up will appear. Click Yes. Choose from the listed banks or payment centers. Click Select > Send Instructions via Email. Check your email (the one you registered with BM Online) for the payment instructions. If you chose Mobile Payment (via GCASH), just enter your 11-digit Globe mobile number and then click Pay. Once your payment has been confirmed or successful, go back to the BM Online System and then click My Transactions at the left side of the page. You’ll see your digital OEC. Click Print Receipt to print your OEC. POEA requires OFWs who will undergo regular OEC processing to set an appointment via BM online before going to any POEA office. An OEC Number Verification pop-up will appear. If you don’t remember it or your record is not found, click on the link to set an appointment. Your My Profile page will appear. Click Change Photo > Upload Photo to upload a profile picture. Click Upload. On the Select Locations page, choose the POEA branch where you want to process your OEC. Click Next. Choose from the available date and time slots. The Appointment Schedules page will appear, where you can view your appointment schedule, venue, and status. Click Print Info Sheet to print your Balik Manggagawa Information Sheet. 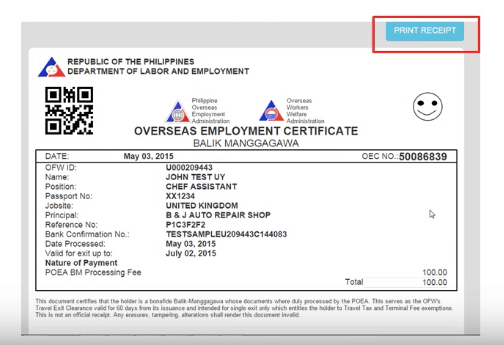 OFWs who are returning to the same employer or job site with a record in the POEA database, collectively called “Balik Manggagawa,” are no longer required to get an OEC. They still need to register with BM online and log in to their account to avail of the OEC exemption. An OEC Number Verification pop-up will appear. Key in your last issued OEC number and click OK. Your My Profile page will appear. Click Change Photo > Upload Photo to upload a profile picture. Choose and click Upload. Click Next Step on the right side of the page. Click Acquire OEC or Exemption. 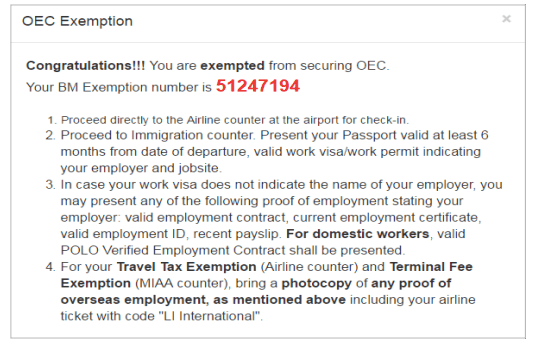 If you’re exempted from getting an OEC, an OEC exemption confirmation pop-up will appear, providing your BM Exemption number and instructions on your pre-departure at the airport. Using the BM Online System for processing your OEC saves you time and helps you maximize your short vacation in the Philippines with your loved ones. If you need help, you can contact POEA via email (bm_oec@yahoo.com and poeaict@gmail.com) or phone (721-0785, 721-9496, and 727-7778).